I’m pretty sure it’s not just me but do you find when you go out for dinner you subconsciously dress to match the restaurant interior? I suppose it is just the animal in us wanting to look comfortable and belonging in a given environment. 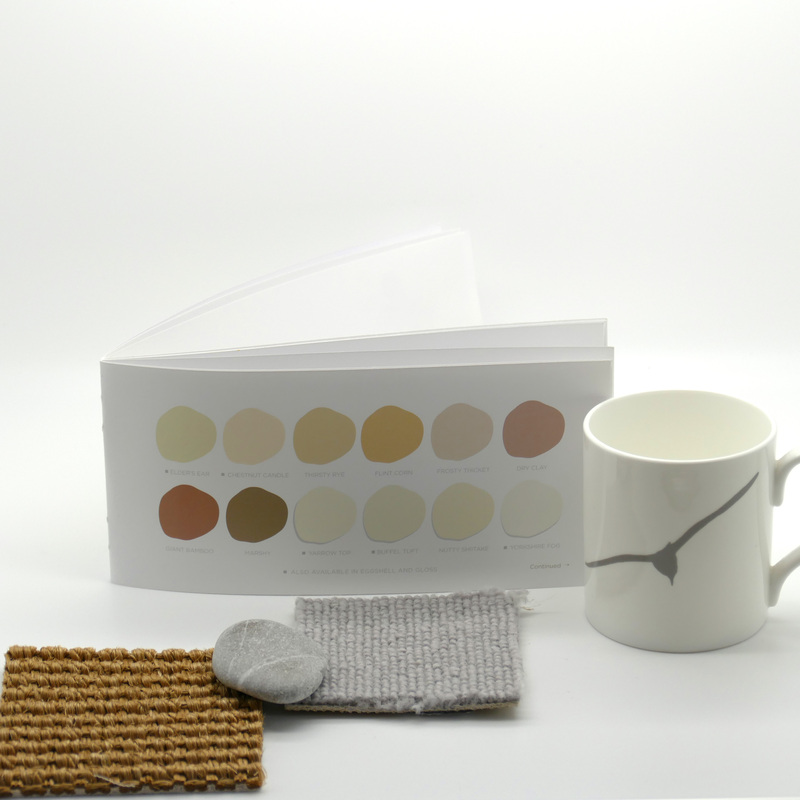 You have also probably noticed that current interior colour trends and fashion colour trends, more than any other year I can recall, are very closely linked. If you would like to look the part in an interior inspired by Miami’s Art Deco shapes and colours (of which there are several lush dens such as Leo’s Nightclub and restaurants such as Sketch London), you need look no further than a silk Sandy Eclipse tie. *The background camel colour of this tie is very difficult to photograph but it is a glorious bronzed camel which plays with the light beautifully at the twist of the knot. Inspired by that very place, Miami. Freedom Tie was also inspired by Miami, by the iconic facade of Freedom Tower. And Lovewell silk tie (perfect for a wedding) which was inspired by Howard Lovewell Cheney’s iconic Miami Beach Post Office building designed in 1937. 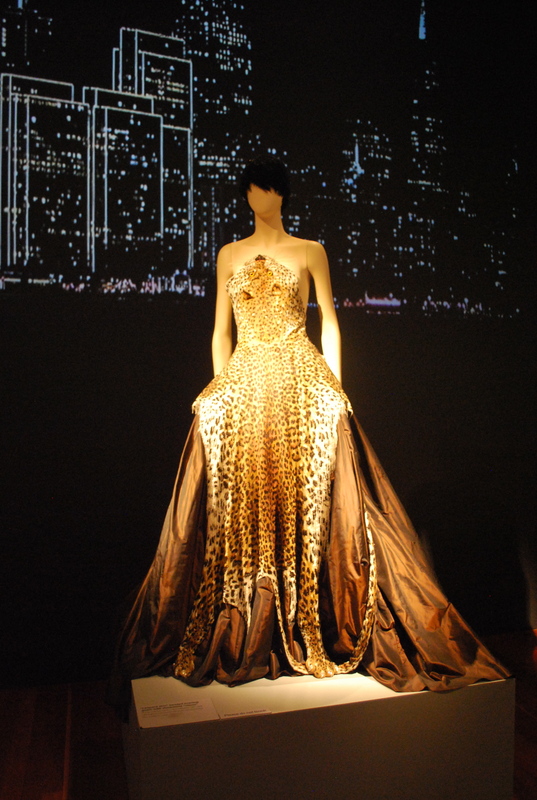 Do interiors inspire your choice of clothes? Having immersed myself in the vast textile trade show, Premiere Vision last week, I can report back on some key trends – but without images – photography is strictly forbidden (taking notes is not even allowed near the stands – stands being white pens with frustratingly high walls with a humid murmur leaking out from within, akin to a set from a Margaret Attwood novel) as the textiles and designs being sold are for 2017 collections and are therefore not even launched. If colour trend forecasting leaves you cold and you put it on par with reading ones horoscope, you just need to attend a seminar at a trade fair and you will find a frenzied atmosphere, a room bursting at the seams with the worlds top decision makers in fashion and interiors – as we know colour can kill or cure a business so they need time to gear up their production to get their pieces out in time to feed our every whim. Of course there are several trend ‘stories’ which gives a platform for a variety of colours to shine but they were mostly underpinned by a juicy, meaty red. Red, we are told is in gutsy opposition to our move towards a plant based diet (although I’m sure the food writers have this covered by giving us lots of other juicy reds from pomegranates to beetroots 😉) It’s quite an impertinent colour trend really as it celebrates fake shiny food, artificial substances, think plastic sushi cartons, rubber cups, and bright synthetic palettes. 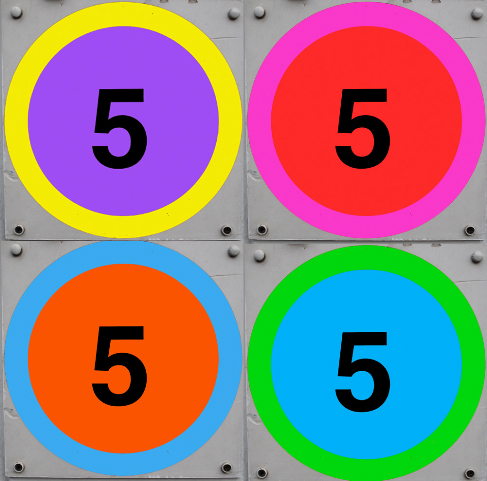 The colours may seem a touch violent and frantic, but it works because only two or a max of three are used together. The theme is really all about contrast, sweet and sour, rough with smooth, futuristic mashed with antique. It is designed to shock, invoke a reaction, look odd and unbalanced. In fact the stranger the better. Individualism is key. Wonky prevails. 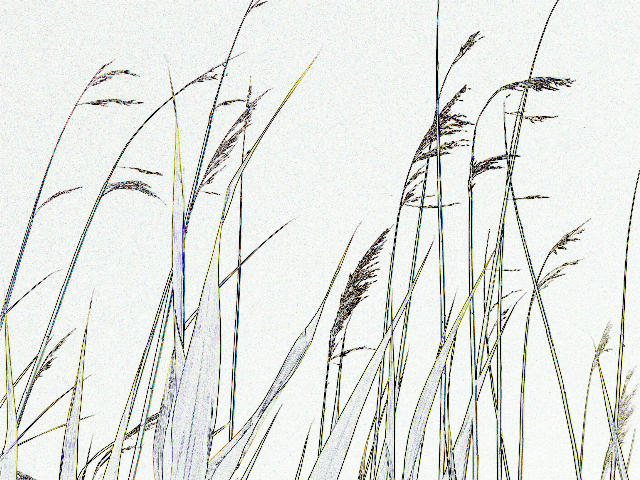 As for patterns, designs are asymmetric, off balance, and shaky. Patterns are ‘placed’ rather than repeated and ‘colouring in’ is imperfect. Registration is ‘off’. Trusty old stripes are back (and so is gingham) but think huge, spectacular and sometimes flawed. No subtleties, no mush, just dynamism. So like anything, frame your colour and design choices around the story of its creation, that’s what is important, it’s your individualism that gives your designs integrity and provenance – we all like a good story after all, and trend forecasters are brilliant at doing just that. 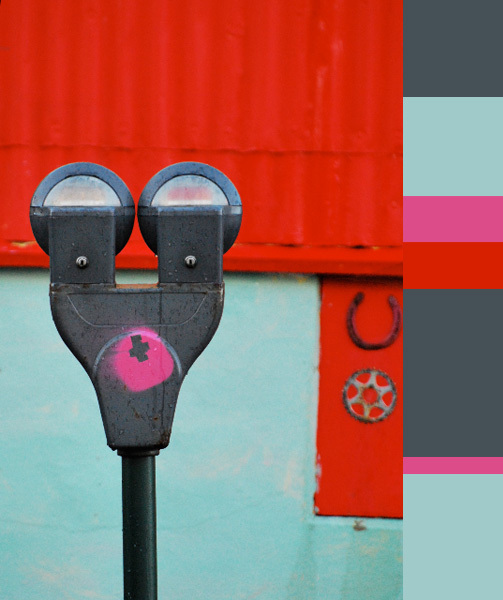 When I started this blog a few years ago, I came from the paint industry and wrote fairly extensively about colour theory – until I searched the web and realised that I was just adding to a plethora of existing blogs about colour. However, today, I am briefly revisiting the wonderful world of paint. Being a bit of a Conran ‘groupie’ I knew they were working on adding a paint range Paint by Conran to their brand and I’ve just got around to looking at it today. It was launched last year but I’ve not seen much evidence of it around Scotland so I thought I would share the colour chart with you. 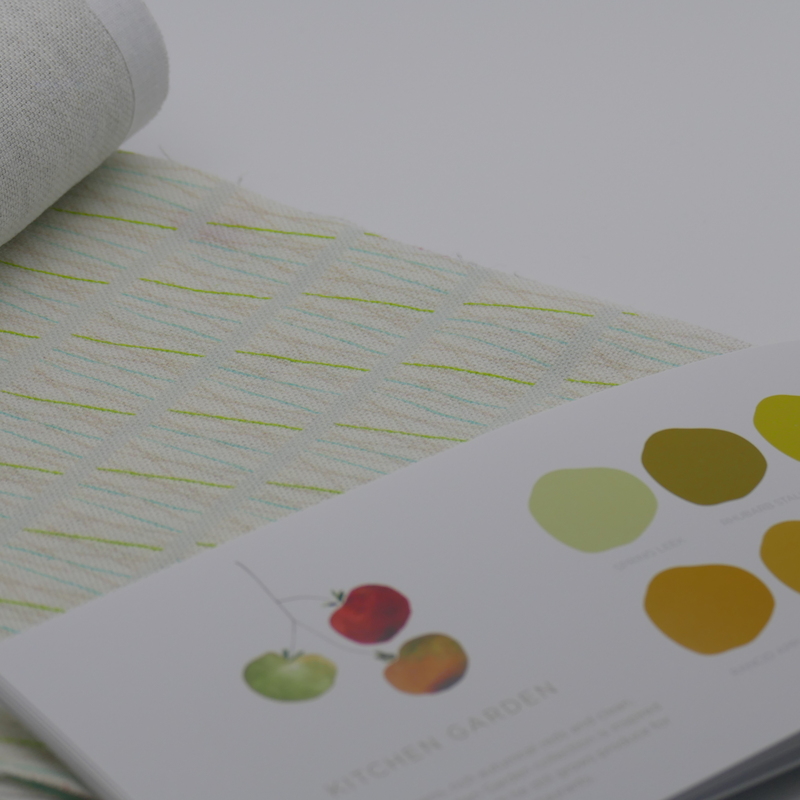 Above are some colours from their Kitchen Garden collection. 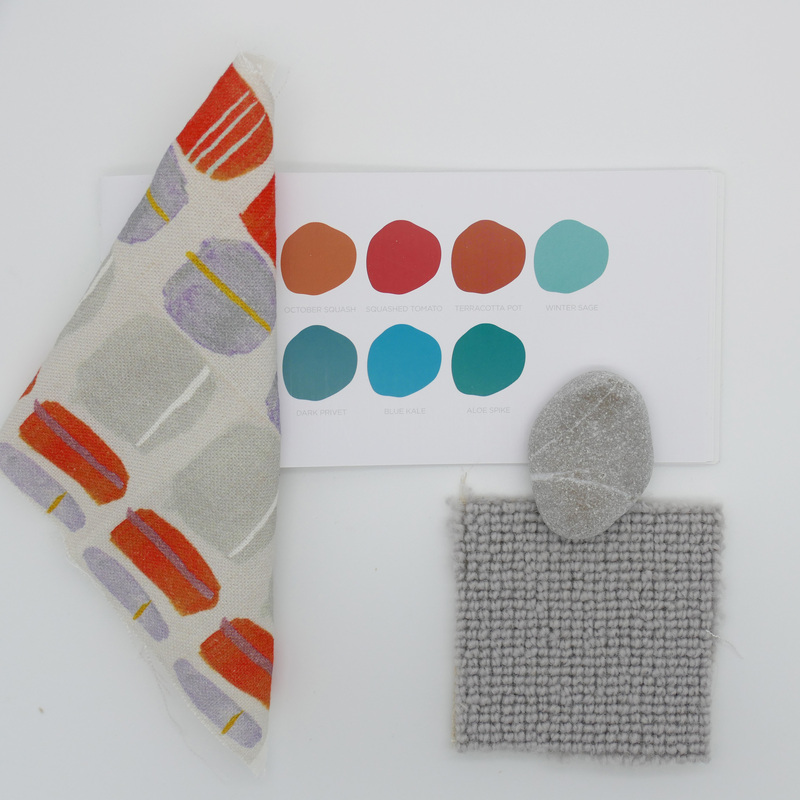 Having just been at a Textiles Scotland ‘Colours Trends Fashion Interiors’ seminar for Autumn Winter 2016/17 I can tell you that ‘Kitchen Garden’ is extremely close to Anne Richie’s predicted colour trend story named ‘Crafted’ especially with the kingfisher blue hues. 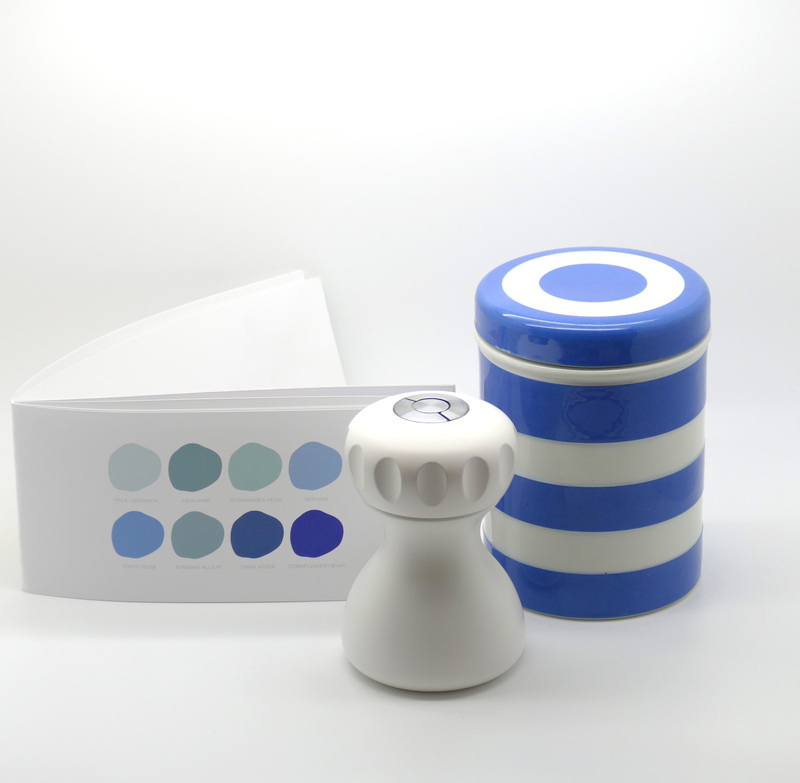 It goes without saying that Conran would include a good selection of blues to the range and Cottage Garden‘ blues manage to look as British as beloved iconic brand Cornishware. 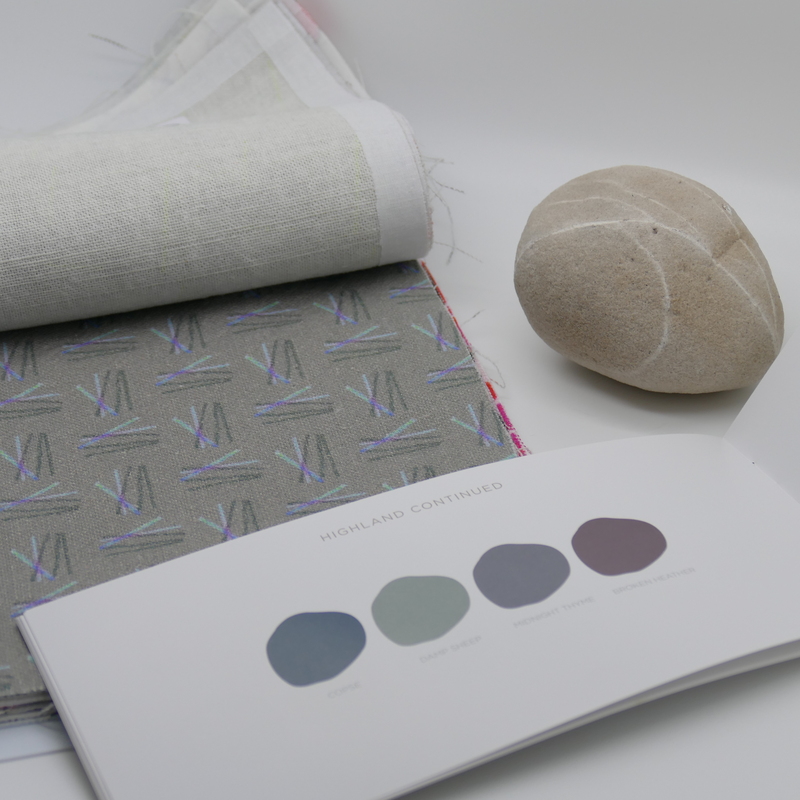 My favourite set of colours comes from the Highland‘ range (deep hues pictured above with tonally compatible paler hues below) inspired by ‘swathes of purple heather, rocky outcrops and hardy windblown grasses’. 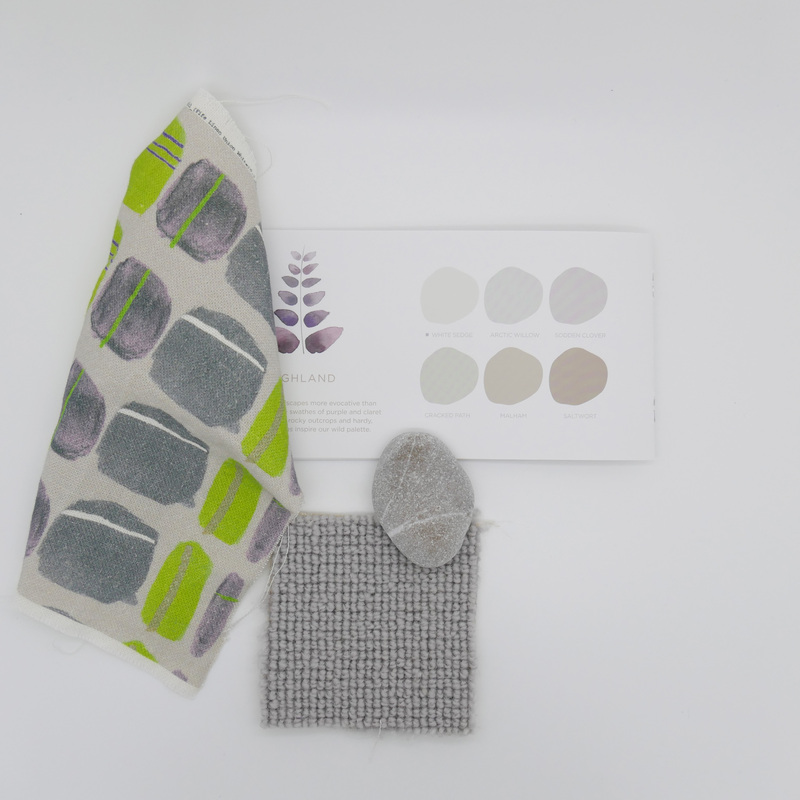 It contains a beautiful soft grey-purple named ‘Sodden Clover’ (third colour swatch below on top left) an excellent choice for a calm contemporary space. If you prefer a warmer palette, you may like the Harvest‘ colours, ‘soft and sun- kissed corn colours combined with deep earthy umbers’. Good pale sunlight colours, excellent for welcoming hallways, although it’s the ‘Giant Bamboo’ (bottom left) that I would like to see as a backdrop to some interesting vintage agricultural equipment hanging in a pared down interior. 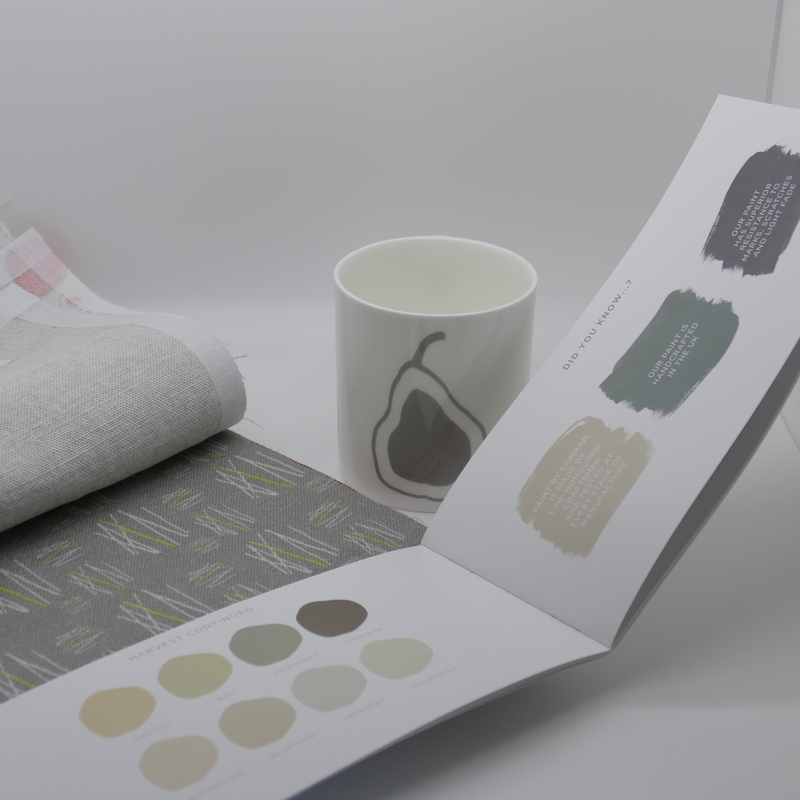 However, if it’s a classic relaxing green that you crave, you will undoubtedly find it in the Orchard Collection, inspired by British Orchards and the seasonal colours of ‘springtime blossom’ through to ‘sodden moss’. A welcome addition pops up rather surprisingly in this set and that is ‘Pippin in Spring’, a beautiful pale pink – a difficult colour to nail as too strong and you have artificial marshmallow, too weak and it’s a dated boudoir. I’ve actually been searching for a non sugary pale pink for a while and I’m very excited to find this. 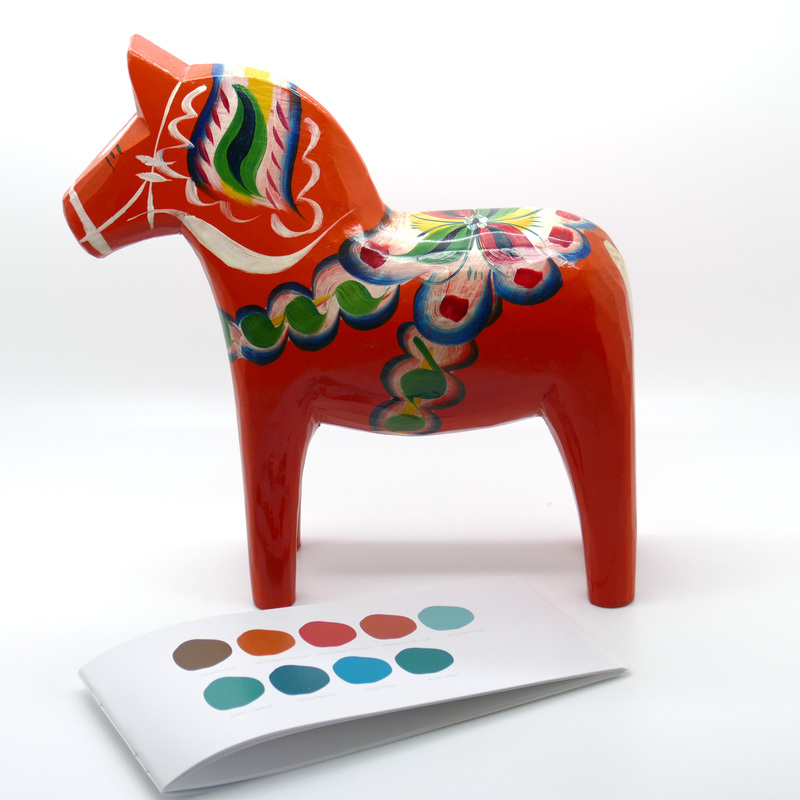 I’ve already shown you the ‘Kitchen Garden’ colours (below) and despite Conran putting every effort into marketing the colours as quintessentially British, I think this collection should really be name after Sweden’s iconic Dala Horse! 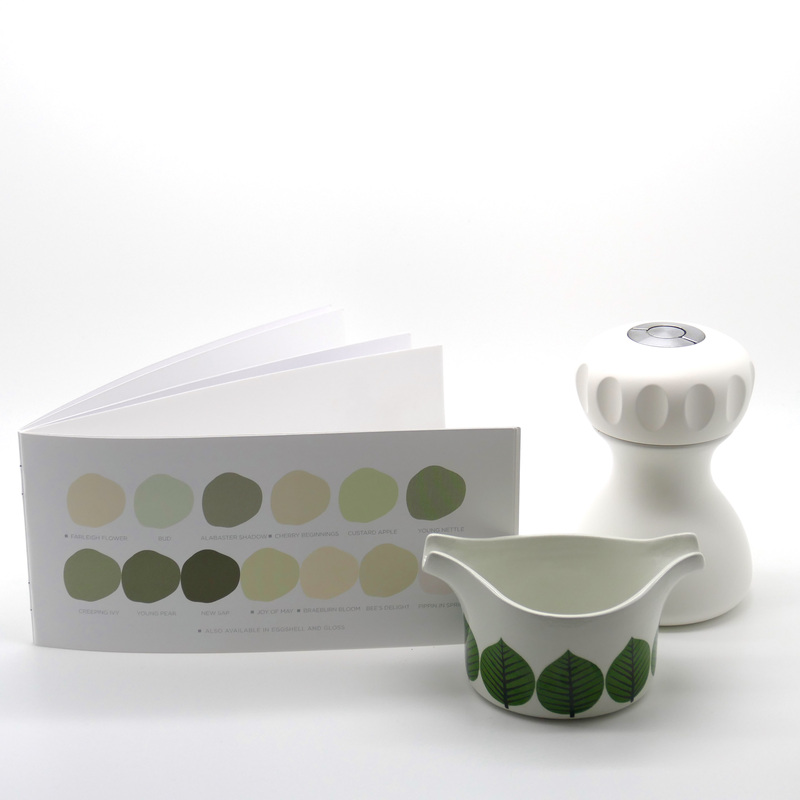 Paint by Conran ‘Kitchen Garden’ collection. 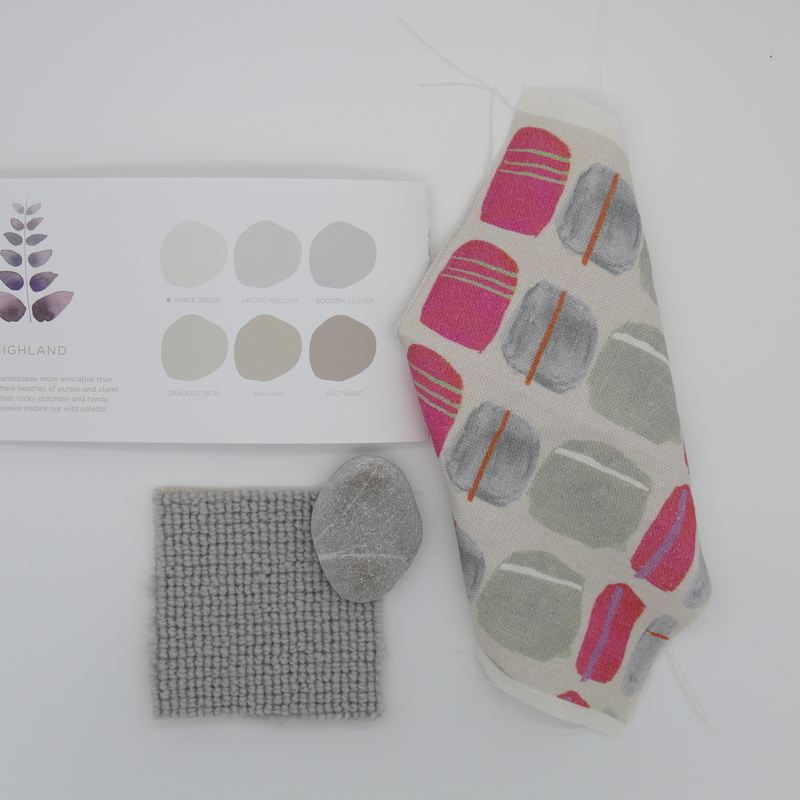 and the Highland collection of colours with Vaki Rocks printed here on Fife Linen. 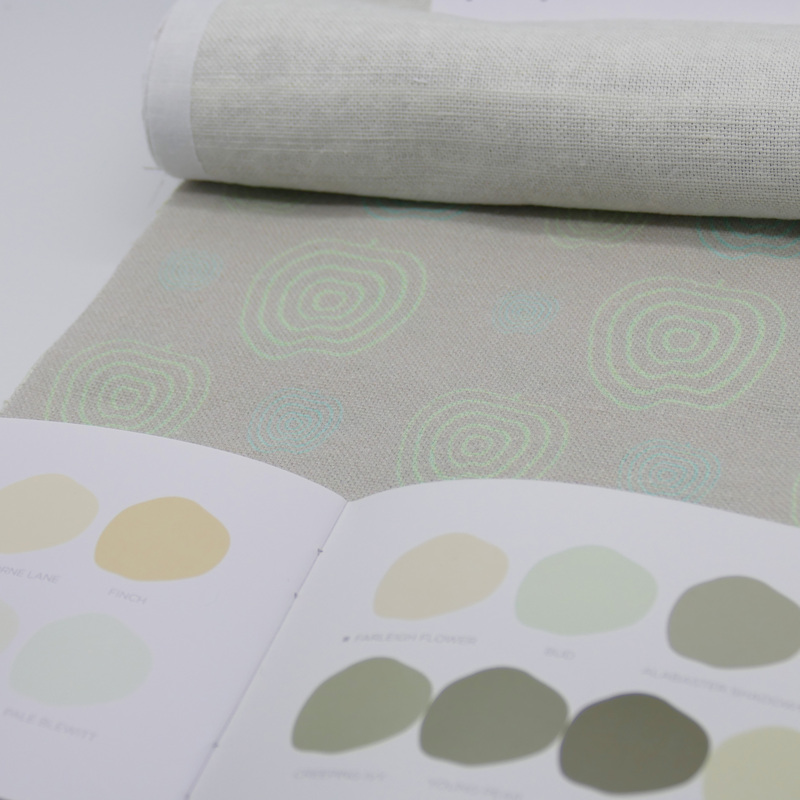 I’ve enjoyed teaming up some of my textile designs with paint colours from Conran and I think their intelligent choice of colours making up the range will make it a joy for interior designer to work with. The paint itself is manufactured in the UK by a factory which has been creating paint for 120 years. They say it’s an ‘extremely durable and hardwearing’ paint and I will certainly be trying it out on my next project. 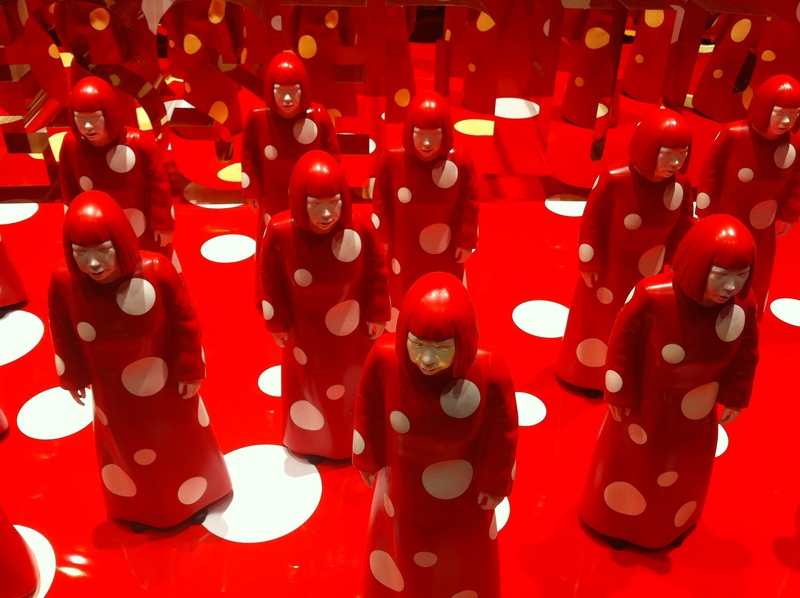 London Design Festival is a great time to visit the city as the number of design shows, workshops, pop up shops are phenomenal and this year was no exception. After visiting 100% Design, Tent London, Design Junction, Designers Block, the Conran Shop, and of course the Design Festival at the V&A, three very clear trends emerged from the shows. The Conran Shop who were launching a beautifully pared down and updated Soda Stream (the perfect Christmas present) designed by Yves Behar decided to show a collection of design classics – all chosen in red which when set against their trade mark blue walls looked stunning. 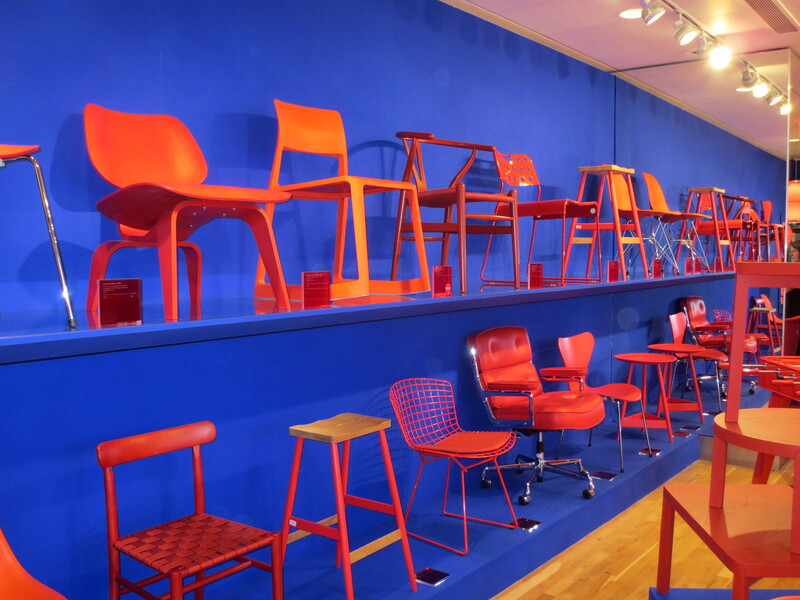 It was interesting looking at chair designs spanning the twentieth and twenty first centuries all being shown in the same colour as it forced you to consider the form of the chair more than you may have done had they been shown in their original colours. 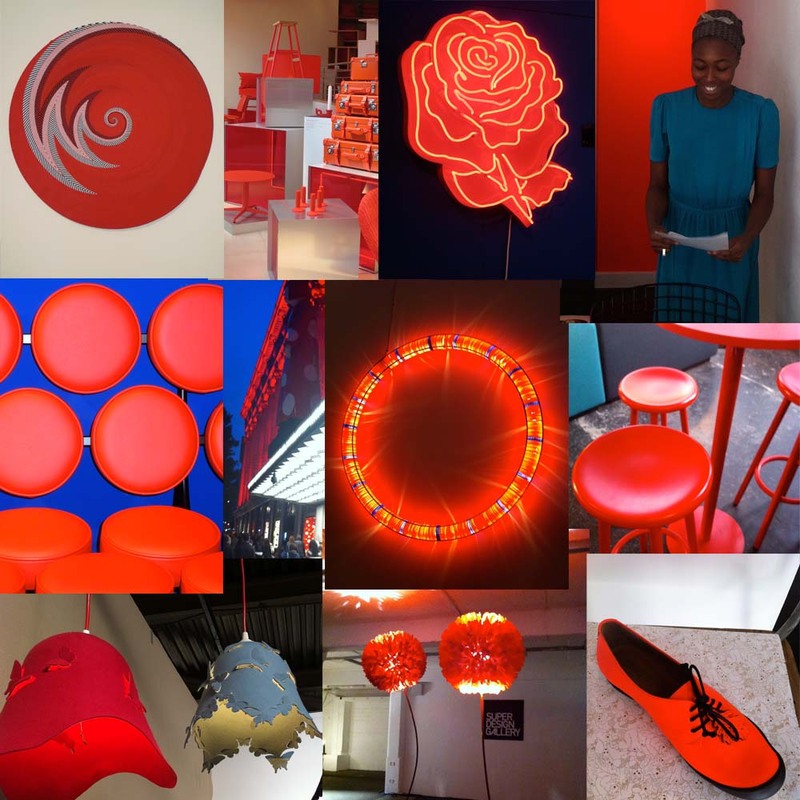 I suspect red is a micro trend derived from ‘London 2012’ and all things red, white and blue as the colour trend predictors tell us that green is the predominant colour for 2013. However, it was certainly an ingenious and arresting colour to use in the exhibitions as the excitement around the shows was palpable. 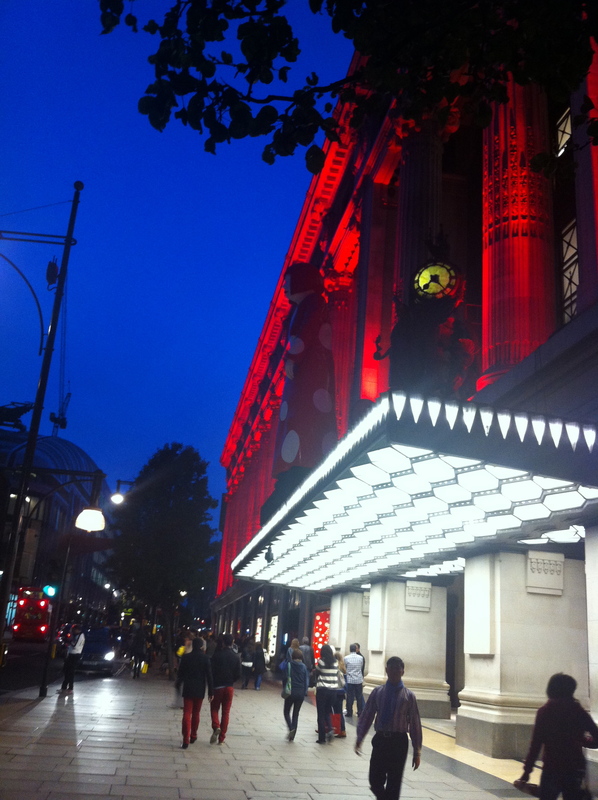 The other two trends (more subtle) I shall put in my next post – this is just a quick post to celebrate all things red. Back soon with the next post. 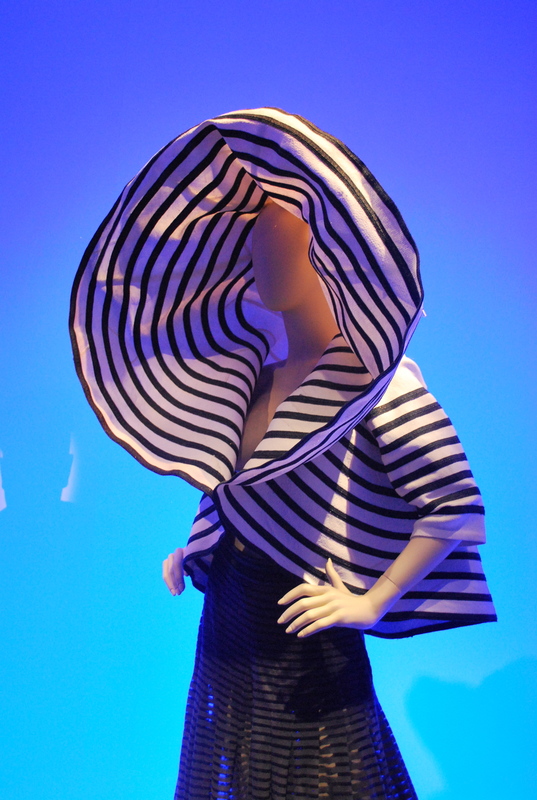 Just in case you thought I had abandoned ship, (I was just distracted by the Olympics and The International Edinburgh Festival) I thought I would share my photographs from the Jean Paul Gaultier exhibition at the de Young Museum, San Francisco taken in July. 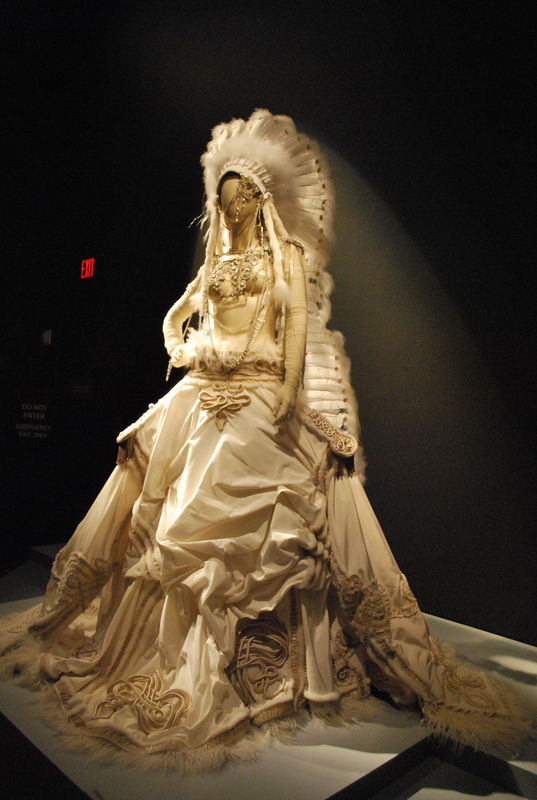 As I am not a fashion writer, I will not attempt to elaborate on the various themes and ideas behind Jean Paul Gaultier’s designs over the decades apart from to say that he is highly influenced by his grandmother whom he idolised and her collection of cloths. His designs celebrate the female form, sometimes with humorous undertones but always in ways to project inherent powers and strengths he sees in women. As we all know, interior trends are deeply entwined with fashion trends and while looking at Gaultier’s mannequins (which incidentally and quite unnervingly start speaking when you approach them) I enjoyed visualising potential interior projects with the colours, forms and themes Gaultier uses in his spectacular designs. 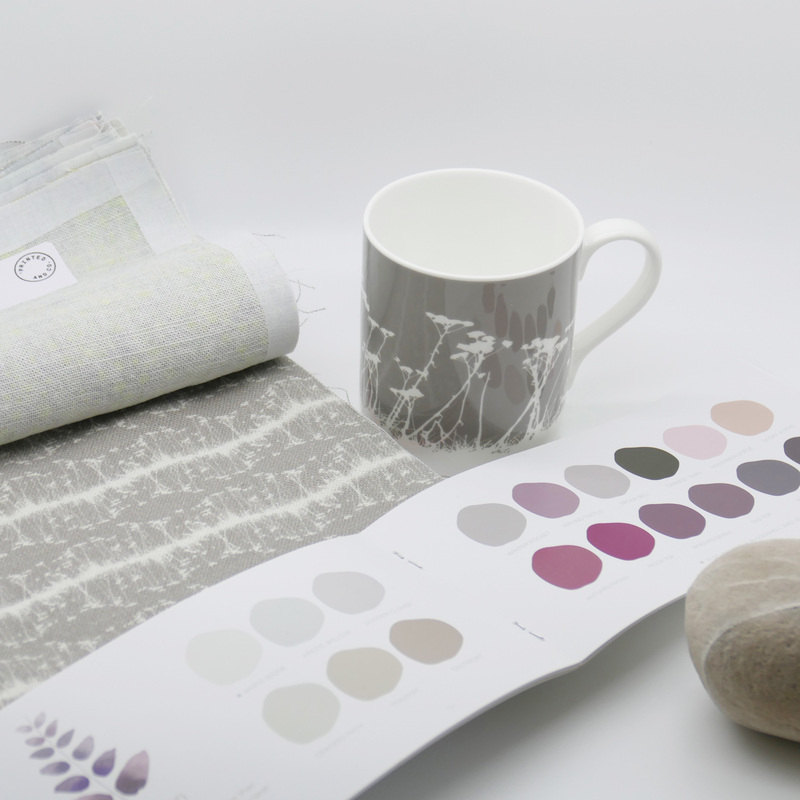 I am thinking Nautical boathouse fused with the 2012 trend for lace detailing – something Scottish lace mill MYB Textiles has been at the forefront of. and the current paint trend for David Oliver’s metallic mix of gold and silver for which he coined the term ‘gilver’. Celebrating the ‘hedonistic exuberance of the 1920’s ….associated with drama, power and wealth…but equally it can be simple, understated and quietly bewitching’, David Oliver from Paint & Paper, A Master Class in Colour and Light. and tribal chic a predominant interior trend in 2012 where skins have been used extensively over many forms of seating – more frequently sheepskins and deer skins draped over classic mid twentieth century Scandinavian designs. 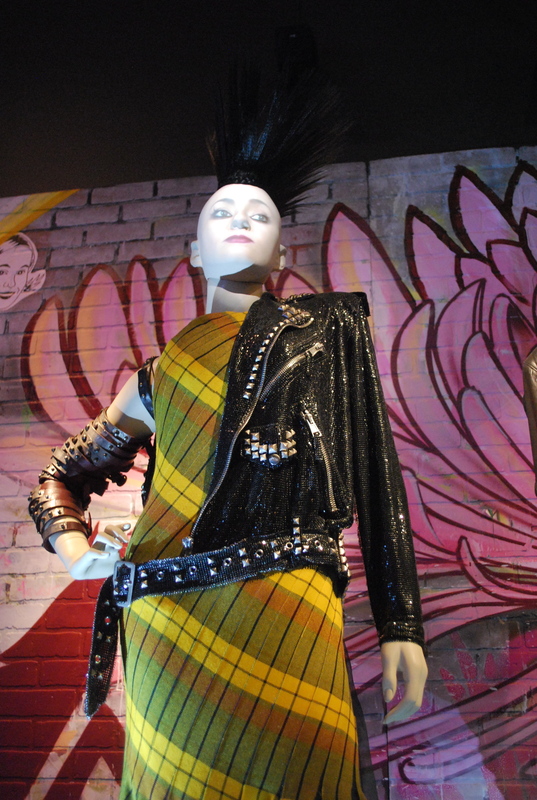 Okay, so my parallels are a little tenuous but nevertheless they are all themes which have played a part in recent interior projects including this next image fusing punk, biker -rock, street with tartan, probably more in bars than domestic interiors but a strong influence for sure. Talking of trends and themes, the most talked about colour for Winter 2012/13 appears to be Ox Blood, not a description I hugely cherish, perhaps an earthy beetroot cordial sounds more appealing but as it’s colour combinations that interest me I am paring the Ox blood with some squid ink (!) and I can suddenly see how this rich palette could make a big impact this Autumn. 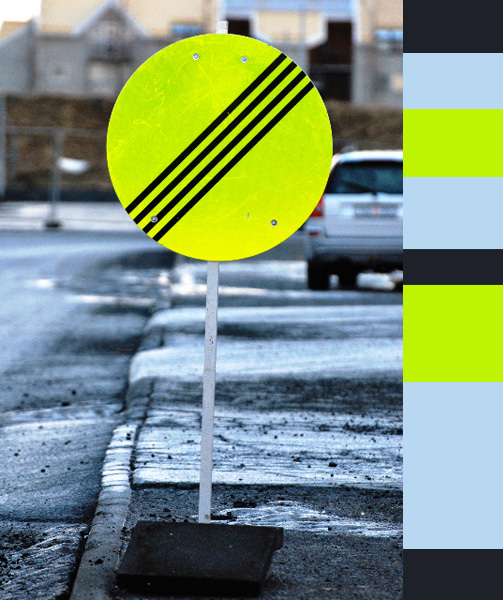 There are many people in the design world who are steadfast against colour trends. I hear what they say and agree to an extent but there is no doubt that colour trends, especially micro, quick, fleeting trends can add a lot of fun and a great ‘edge’ to an interior. I am not suggesting you embark on an interior makeover every time a colour trend emerges, that would be ridiculous and very expensive, but interiors should inspire, excite and explore new techniques in order to keep them alive. Perhaps I just have a low boredom threshold but can you imagine your favourite interior shop where and the products remain the same colour every time you visit? I really don’t think that would be much fun. Enter ‘new neon’. We are talking, ultra clean-cut, sharp, pulsating colours. Use it in really small areas and it can literally transform a space from dowdy to cool without much effort. The obvious way to do this is with small accessories like a vase or a cushion or even just a zip but I have been trying to source a neon paint to use over a few old randomly shaped glass bottles I was going to dump in recycling. I rather fancy a still life, Giorgio Morandi style but within the group of ever so chic well balanced neutrals slotting in an unhinged neon. Glowtec UK have a neon paint range which they claim can be used outdoors too. The trick with this micro trend is definitely less is more. The fashionistas are wearing it on nails, belts or satchels along with ultra femimine tailoring worn in baby soft neutrals tones. It’s the shock factor that this trend is trading on. Pantone of course have a range of neons (801 to 807 being some of the punchiest) but they are designed for ink printing so most paint stores are unlikely to have the formulation to mix them as paint. 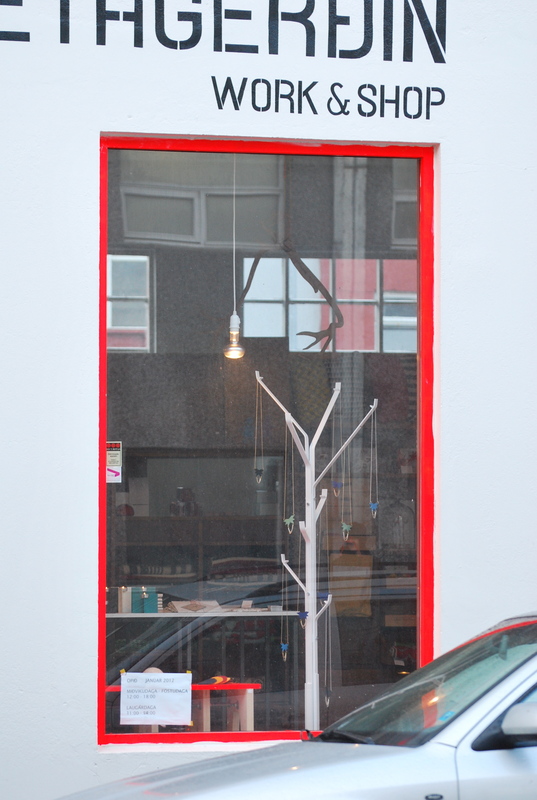 You may have spotted the image below in last weeks post – it was the neon window frame of this design store in Reykjavik that lured me into the workshop. A great example of really working this trend to full advantage. While Pantone have chosen Tangerine Tango to be their Colour of the Year for 2012, Dulux opted for a lively juicy red but Crown paints have launched a whole new colour palette, New Directions ,which is intended to encourage us to mix traditional colour groupings together i.e pastels with neons, brights with neutrals, neutrals with pastels (but all still under pinned by neutral grey). 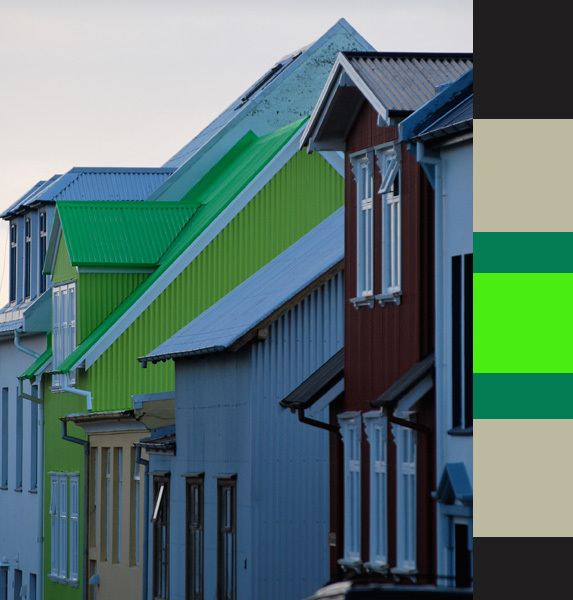 So it looks like 2012, Apocalypse or not, is going to be a colourful year with plenty of trending hues emerging from the warm side of the spectrum. 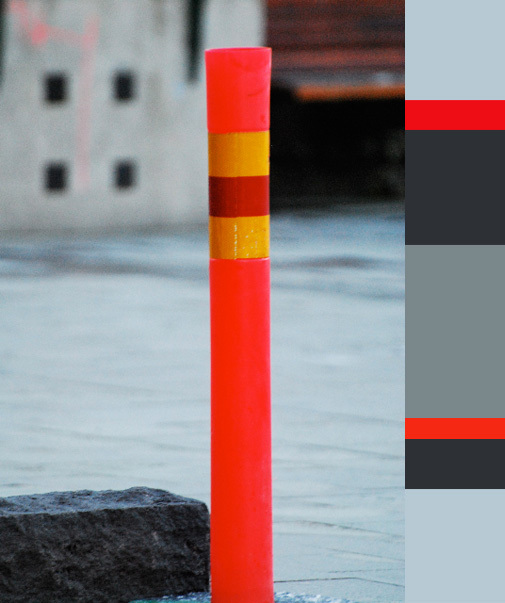 It will be interesting to see what iconic Danish brand Vipp will choose for 2012 as their 2011 colour was ‘rising red’ – I will tell you as soon as they announce it but I have a feeling we may see something with a violet tone to it. Anyway, lots to look forward to but most of all I would like to take this opportunity to thank all subscribers and readers of my blog for being so supportive and jumping in with brilliant comments throughout the year. As all bloggers know, receiving feedback is what it’s all about, so thank you all very much indeed and I hope you have a wonderful Christmas and I look forward to catching up with you around the 5th of January 2012 for another colourful year. As I sit here at 55 latitude, I have to report that summer has definitely vanished. 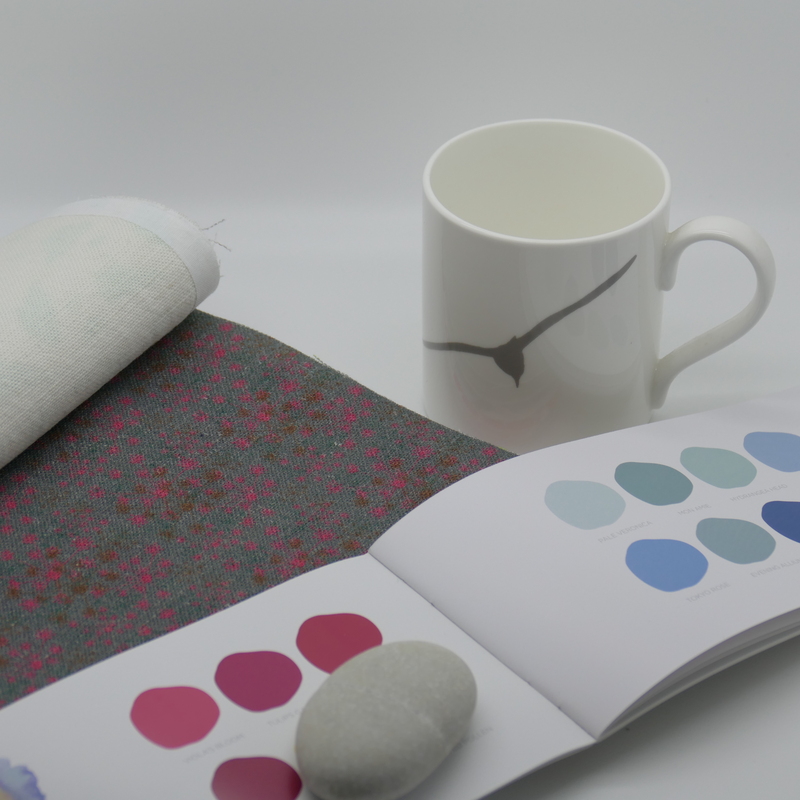 The shops are filling up with heavy textiles and the colour palettes are rapidly changing. 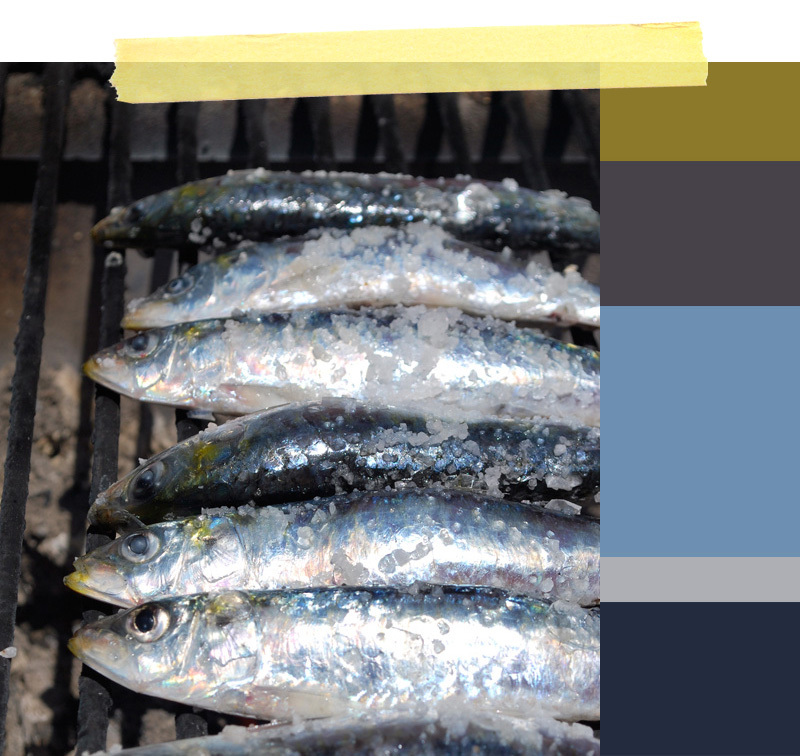 However, it is still August, so I thought I would pin up some summery palettes and interestingly each image contains one colour that is going to hang on well into Winter 2011. Sulphurous yellow is likely to be a key micro colour this winter. 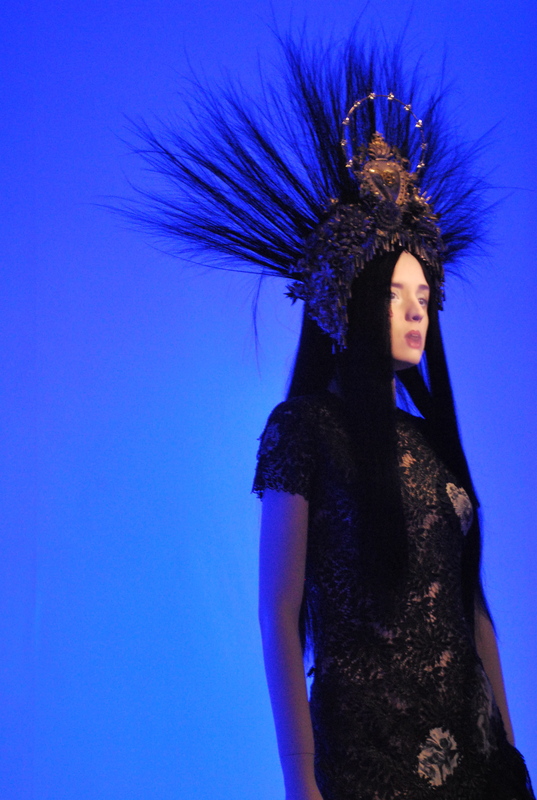 Used for details to lift a moody room, or on the catwalk to make fun of grown up tailoring, its presence even on very small areas will be felt. Inky midnight blue is another colour I think we will see but this time on larger areas. Not a conventional navy, more a bruised navy heading towards off-black. A great backdrop for artwork and a colour that can easily add sophisticated drama to an interior. Farrow & Ball’s Hague Blue fits the bill but if you are looking for less saturation, Paint & Paper Library’s Blue Blood is a stylish “easy on the eyes” blue. Little Greene’s Juniper Ash a hazy airforce blue-grey would be a softer choice while Valtti “St.Peter’s Boat” a powerful blue-black would create an interesting feature wall. I’ve been working with a lot of highly saturated colours recently so I now feel more than ready to pare down my palette and experiment with less weighty hues. However, when I use colours which display only subtle contrasts I like to introduce an extra dimension to the room through texture. Generally speaking, the more light reflected from a surface, the lighter that surface will look, not just in colour but it will appear physically lighter as well. A rough surface which absorbs a lot of light will appear “heavier” than a smooth surface which bounces much of the light back into the room. 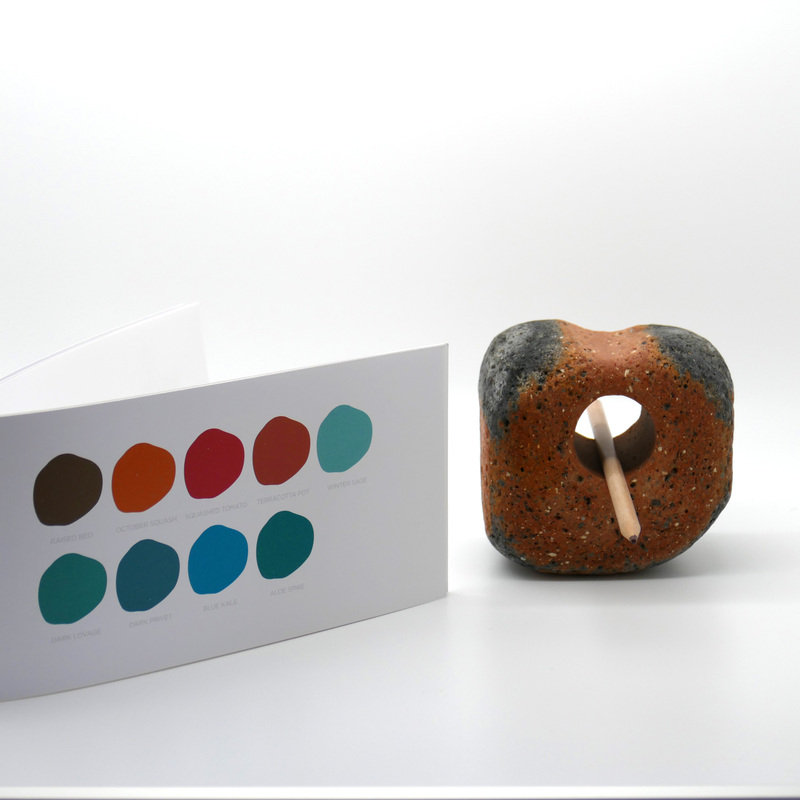 It is therefore easy to make textural contrasts by placing rough (heavy) surfaces next to smooth (light) surfaces. Textural contrast definitely adds a new layer to a room and the more layers you include the more interesting the space appears. However, it’s a relatively new concept to mix textures. If you visit a museum of a mansion house you will not see many textural contrasts in the interior but you will see plenty of colour contrasts. Textural contrasts is something that was introduced at a time when monochromatic colour schemes were popular and it became evident that the space require another layer of interest. The “texture tool” is also great for changing a room’s ambience from a summer to a winter season. Rougher (heavier) textiles can easily be added to create some winter warmth and weight while lighter sheers and silks help to lighten a room for summer. 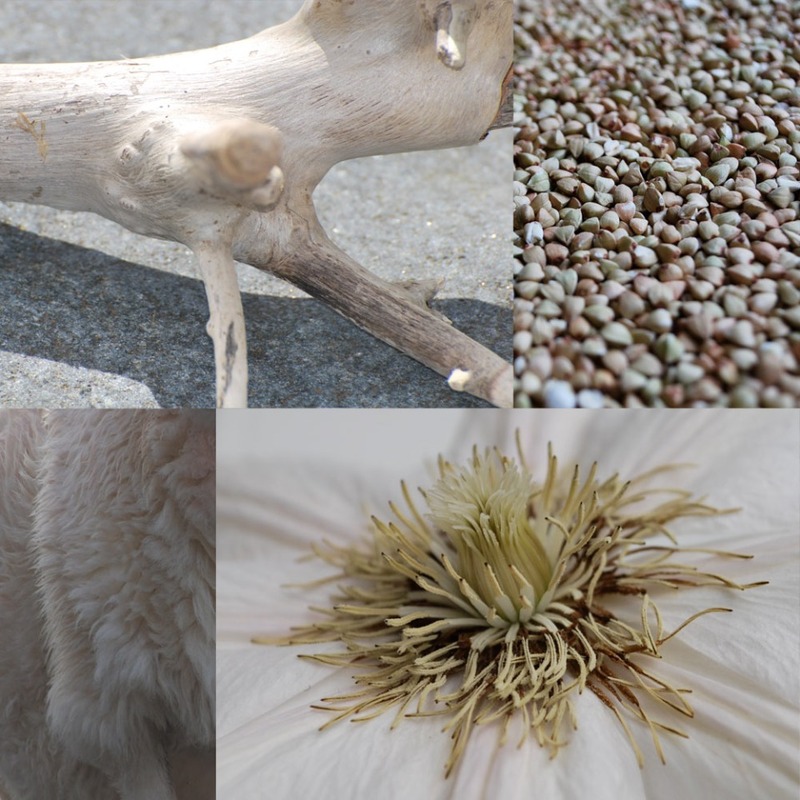 The recent trend for paler, cooler, less saturated colours looks likely to carry on past the Summer Solstice and through into Winter 2011/12 so make sure you add that third dimension into your interior and start experimenting with texture. I found myself in Paris this week absorbing three very distinct colour trends. 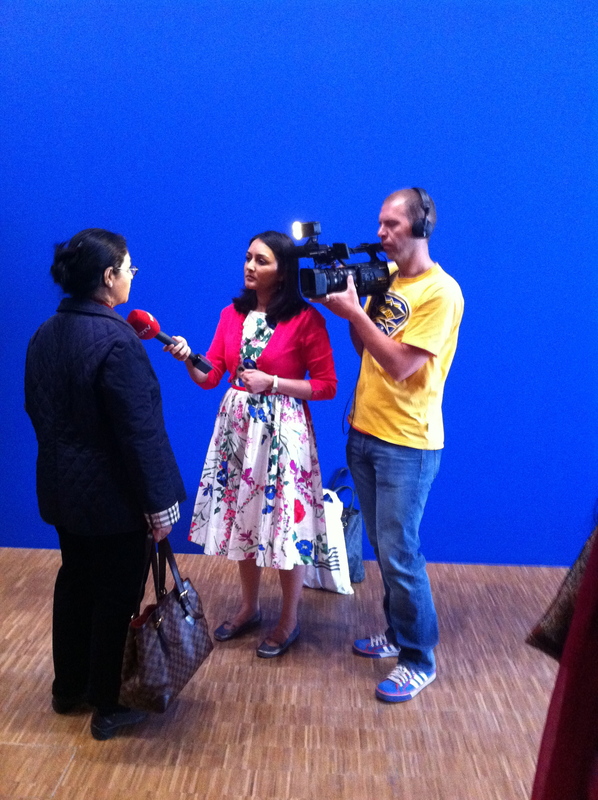 The “beautiful people” (of which there were many) were wearing one of two colours – tangerine or Yves Klein blue. No pattern, just unpolluted blocks of colour neatly sitting next to their rather tanned and toned limbs. 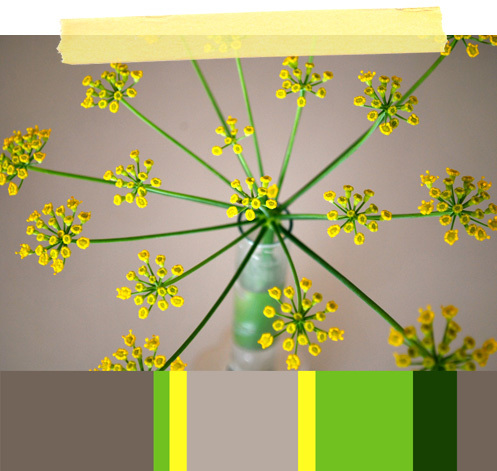 Colours which can translate to your interior as feature walls. 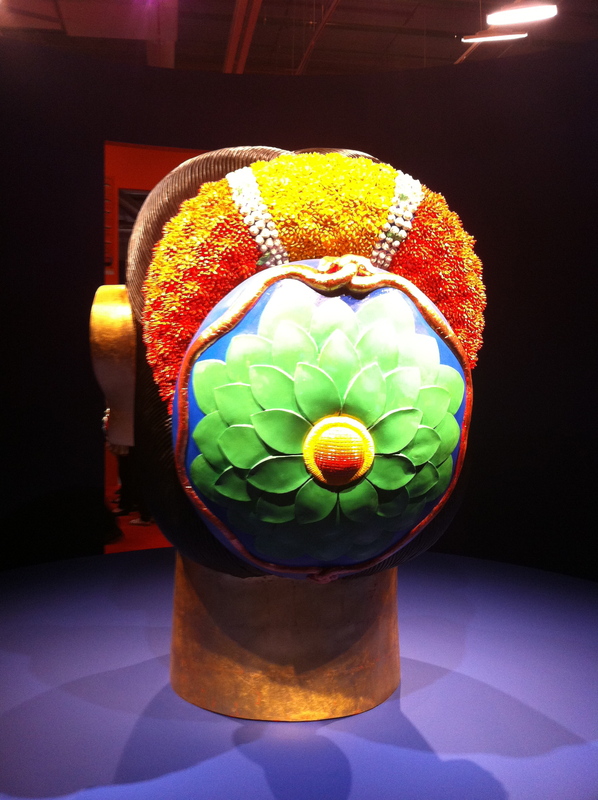 The next was a fusion of kitsch and Indian inspired colour combinations mirroring the creations in the newly opened Paris-Delhi-Bombay exhibition in the Centre Pompidou (more from that exhibition in my next post). Basically a lot of very hot pink colliding with saffron yellows, ruby reds and chlorophyll greens projected even further by shimmering surfaces and mirrored mosaics. 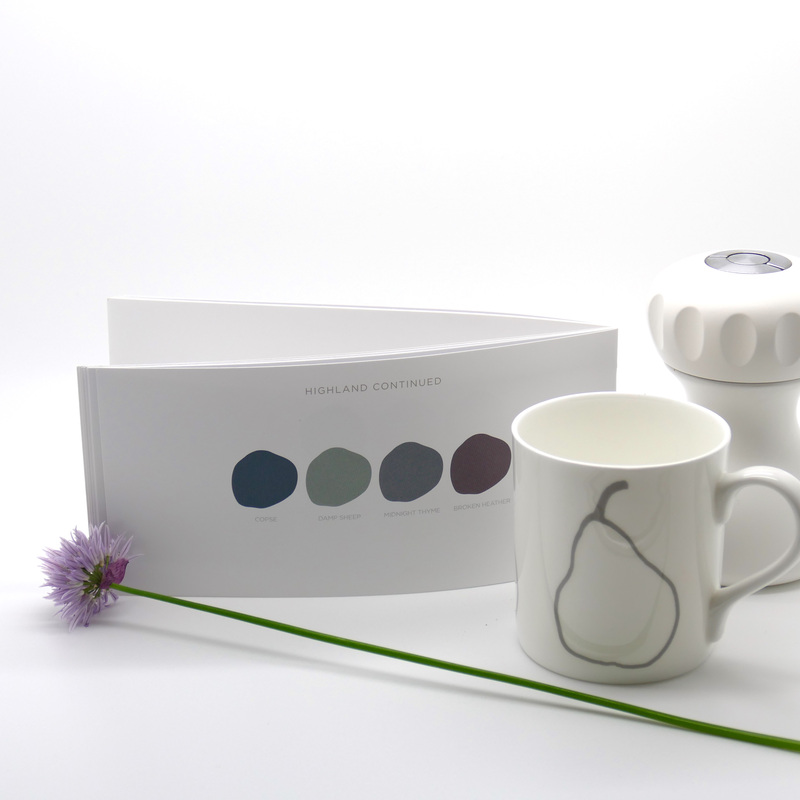 These colours move into interiors by way of accessories. But the other set of colours that really stood out was something I think we will see a lot more of. The sorbets. Squeaky clean hues, not like the pastels of the 1980’s, much fresher, more acidic but still really pale. Pale with attitude. Pale with a punch. The exciting thing about this set of colours is that as long as they are of similar “weight” you can pile lots of them together. An entire house can be decorated in pale sorbets without becoming “cluttered” or fragmented. They flow well and don’t fight for attention. It will be interesting to see how magazines market these sorbets as they are difficult to photograph but ever so easy to use.